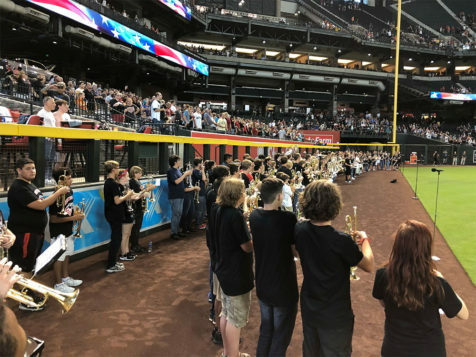 Home Tags Articles tagged with "marching band"
Saturday, the Maricopa High School Marching Rams traveled to Chase Field as part of the annual Diamondbacks Band Night. The Marching Bands performed the National Anthem among bands from Tombstone High School, Desert Mountain High School, Ironwood High School, Raymond S. Kellis High School and Rancho Solano Prep. The massed band was led by Rebecca Robinson, band director from Tombstone High School. Following the performance, the band enjoyed watching the first-place Dbacks take on the Seattle Mariners. 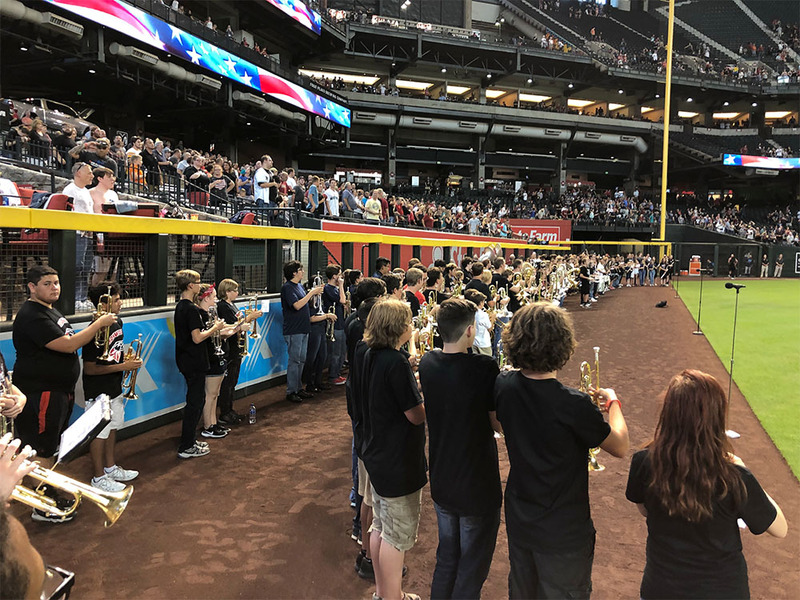 The Maricopa High School Band was honored to be part of this event and would like to thank Rebecca Robinson for her leadership of the group as well as Tom Demeter and the Arizona Diamondbacks for coordinating this event and making this opportunity possible. The Marching Rams will be back for Homecoming on Sept. 14 and open their competitive season at the AzMBA Millennium High School Show on Sept. 22. 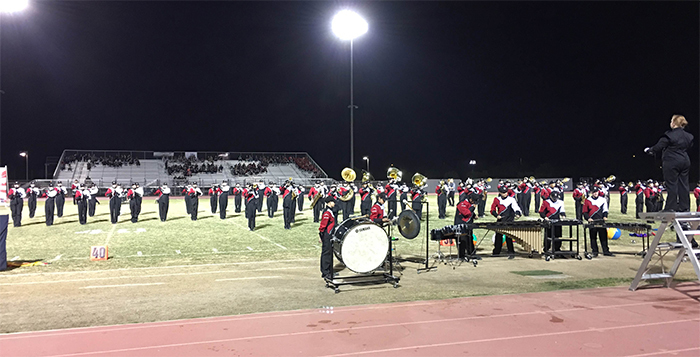 The Maricopa High School Marching Rams performed their 2016 field show, “Postcards,” for the last time on Saturday at the 1A and 4A Class AzMBA Championships at Perry High School in Chandler. The Rams placed seventh in class 4A, and gave their best performance of the season, earning their highest score of the year – 70.10. The students earned praise for their performance energy as well as for capturing the different musical styles of their show. Pour was again voted “favorite director” in the fundraiser/voting contest at the event. “It was a wonderful night of marching band music and a celebration of a great season,” Pour said. The Marching Rams will perform their show music one final time as part of our Fall Music “Pass in Review” Concert in the Maricopa High School Performing Arts Center at 7 p.m. on Dec.6. Admission is free. The Marching Rams will also appear in the Ak-Chin Masik Tas Parade on Dec. 10. Like any school program, Maricopa High School Marching Band has a lot of needs. The growing student population means a shortage of uniforms. Contest judges consistently comment the band needs more sousaphones to give the band a richer undertone. The drum line is well past its prime and showing it. When prioritizing, it was decided new uniforms were No. 1 on the list. That became the focus of fund-raising over the past couple of years. The other issues, like the aging drum line and a shortage of sousaphones, were set back with hopes of finding funding later. An announcement this week by the Gila River Indian Community, however, could check all of those items off the wish list. Uniforms themselves are very expensive. While the band members were rounding up about $5,000 a year, it was still well below what was necessary. “We knew we needed to do a lot more than that,” MHS Music Director Ivan Pour said. The entire district is under a tight budget, though it has done what it can to help the music department. Last year’s agreement with the district to match the department’s fund-raising efforts brought the total to almost $30,000 to buy more than 100 uniforms. The uniforms did not include proper marching-band hats. This year, in debuting their new uniforms, the band members have been wearing baseball caps. There is also a shortage of uniform pants. Parent Carol Shrock heard about grants available from Gila River Indian Community (GRIC) and Ak-Chin Indian Community. Such community grants from gaming funds often go to police, libraries and food banks. A marching band seemed a novelty for that program, but Pour suddenly became a grant-writer. The first grant due was from the GRIC. The band director had a week to fill out the application and submit it. This was near the end of the girls’ basketball season, and Pour filled out paperwork on the bus as the band traveled to Glendale in musical support of the team. It was the beginning of a seven-month process. Gaming contributions must go through cities and counties. 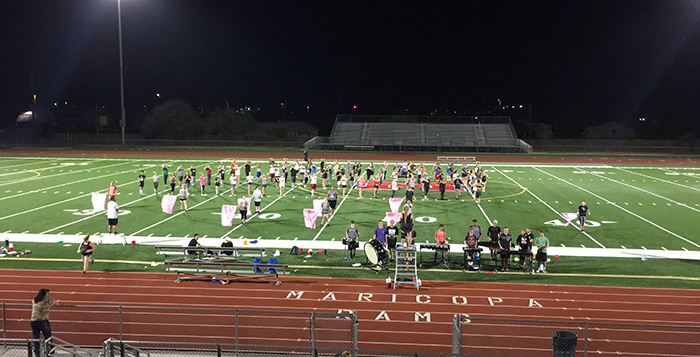 MHS Marching Band partnered with Pinal County and had to get that body’s approval, too. Wednesday, Pour was informed the Gila River Community Council had voted unanimously to approve a grant for $75,000. It will be paid over two years to the Maricopa High School Band Infrastructure Project. Though he has not yet been able to speak with a GRIC representative about the grant, Pour believes the band’s reputation had the attention of the council, and the growth of the band has included more GRIC members. Pour said the funds will not only allow the band to buy 60-90 pairs of uniform pants, hats and plumes for everyone and the hat boxes to put them in but also will meet the other needs that have been on the back burner. Normally, pieces of drum line are replaced every six years. MHS band’s drum line is more than 10 years old. The sets were already used when the school purchased them in 2006. The funding will allow the school to replace that drum line. Then there are the sousaphones, or marching tubas. The band has been using three tubas, a paltry number for a top-of-the-line marching band. The small-bore tubas are actually meant for orchestra use. Pour said the result of the grant will be seven sousaphones on the field, and the orchestra tubas will be able to go back inside. The band has not had enough spare instruments to rent to parents who do not buy. Renting from stores can be $20-$50 a month, depending on the instrument. As the school’s music department picks up a few more pieces, parents will be able to rent at a fraction of the store costs. Along with huge gratitude to GRIC, he thanked the district and the county for coordinating the grant process. 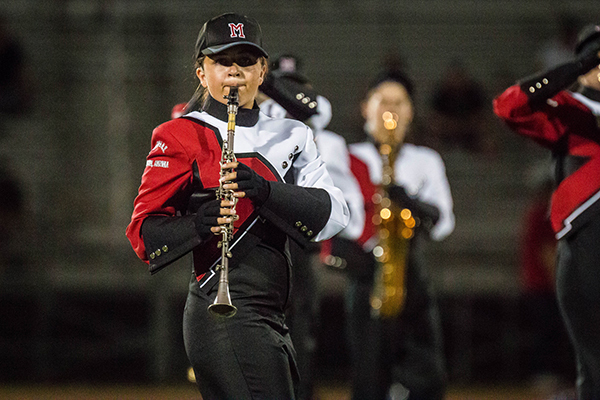 Saturday, the MHS Marching Band will perform at the Arizona Marching Band Association (AZMBA) Mesquite Show along with 11 other bands. Oct. 22, the Rams will be in the Sounds along the San Tans Marching Invitational at Basha High School. Growth changes many things. 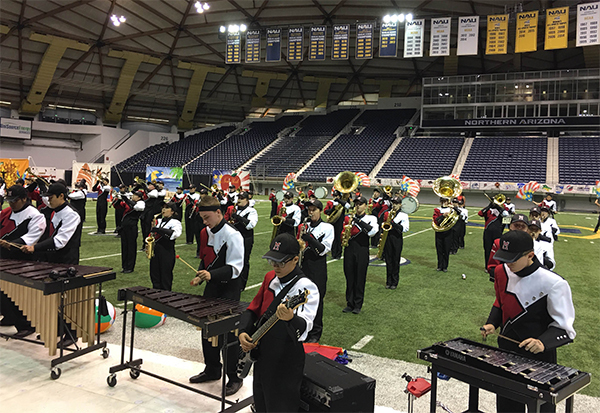 Along with the Maricopa High School football team and athletic programs, the Maricopa High School Marching Rams will move to a new, larger division in two different associations for the 2016 marching season. The band has experienced rapid growth over the last five years, from less than 30 students in 2012 to 118 this year. 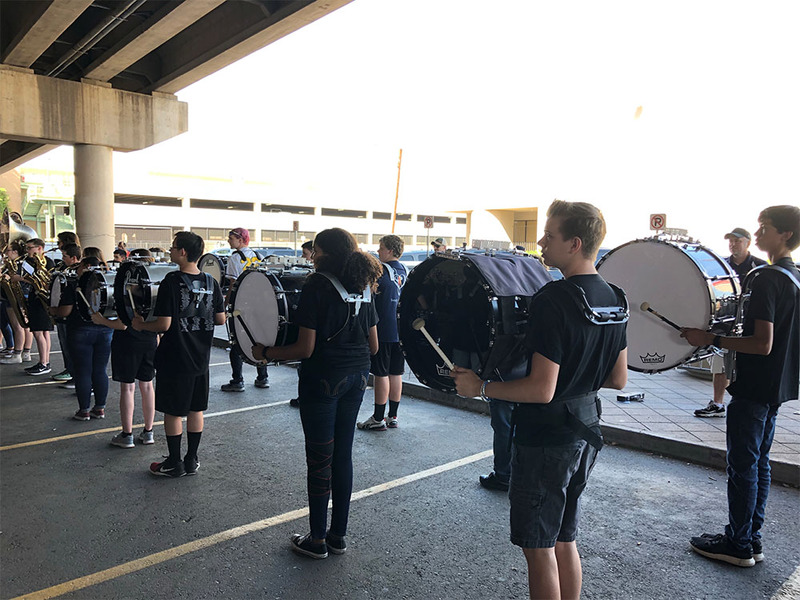 This puts the Marching Rams into Division 1 for the Arizona Band and Orchestra Director’s Association (ABODA) and the 4A Class for the Arizona Marching Band Association (AzMBA). Both classifications are the largest classification possible. 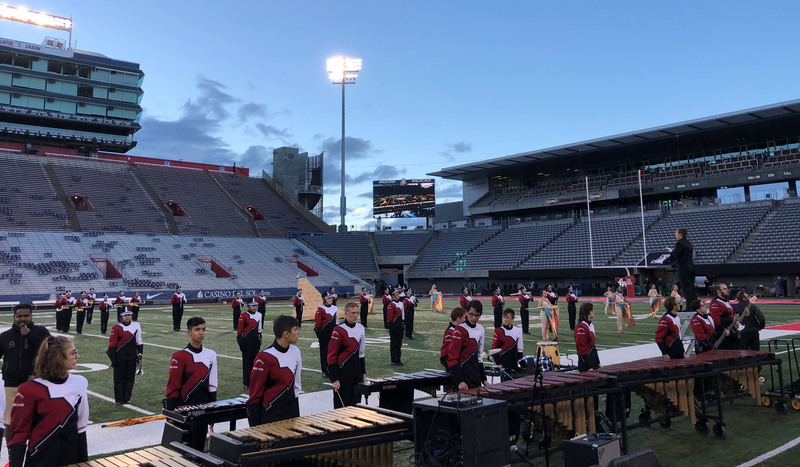 Maricopa High School’s band director will see a boost in his pay next year that would put him on par with varsity basketball and baseball coaches. The Maricopa Unified School District’s Governing Board approved the higher stipend for the position Wednesday night after some of its members called for the increase at previous meetings. Under the new stipend pay scale, the marching band director, Ivan Pour, will receive an annual stipend of $3,400, up from $2,600. “This is a good start compared to where we were,” said Board President Patti Coutré. Board Member Torri Anderson said she believes the marching band director should be paid at the higher rate that the athletic trainer is paid, which is $3,600. 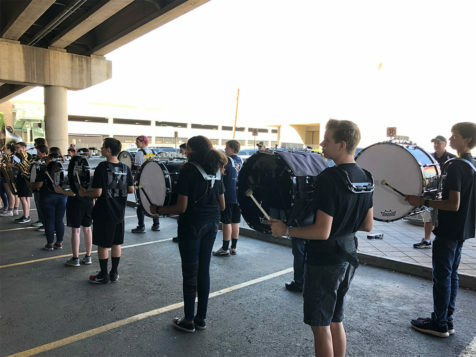 “The amount of kids, the amount of time, the amount of awards, I think it’s more of them than the other ones,” she said about the band director in comparison to other coaches. At the MUSD board meeting on June 8, Anderson and Coutré argued that due to the heavy work schedule the band director has throughout the year, the position should be paid more. They also called for raising the stipends for varsity high school coaches so all sports would be paid equally, which was not included in the approved stipend changes. A more comprehensive revision to the stipend pay scale could be adopted with the involvement of a special committee, said Steve Chestnut, MUSD superintendent. Those future changes could be made retroactive to affect the pay for the upcoming school year, he said. The revisions for the upcoming school year also included an increase in stipends for MUSD teachers and administrators who hold doctoral degrees from $1,000 to $2,300. Chestnut said this change reflects the higher stipends that other school districts pay to employees that hold higher degrees.